We store the equipment. You take advantage of our listing, storage and selling experience to maximize resale value. We manage the details and pay you cash when it sells. Clear out complete lines or multiple machines quickly. Our Consignment Program allows you to free up space now and use SIGMA's professional sales team. 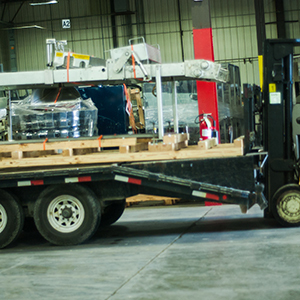 We coordinate pickup and transport of your consigned equipment. Our professional rigging staff ensures safe removal and relocation of your equipment. Once at our safe, secure, climate controlled warehouse, our professionals fully photograph and document the equipment to create a listing on our website. Your equipment will be posted on our website and may be included in email marketing campaigns to our 65,000 subscribers. Interested customers contact us for information and we work directly with them to ensure your equipment meets their needs. We act as the single point of contact during the information gathering and negotiation stages of the sale. We present you with reasonable offers and you give final approval. After negotiating the best deal, we collect payment from the buyer and verify its authenticity. Money is then transferred to your account, leaving you with zero risk of returned funds or other potential vulnerabilities. We arrange shipping with the buyer.